Do you want to slip out of your old vehicle and into a nice new Kia for sale, but you worry about affordability? Ewald’s Kia dealers near you can help you out with that, as we offer plenty of great Kia finance options to help you fit the car you want within your budget. Many drivers that want to get into a stunning new Kia vehicle for sale can take advantage of our popular Kia lease specials and offers, which help drivers like you get into the new Kia you want without draining your wallet. With Ewald Kia’s lease deals near you, you will be back to driving in no time with a car you love. Do you want to get yourself into a brand new Kia vehicle for sale, but you are not sure what a Kia car lease can offer you? Well, figuring out what a Kia car lease in Milwaukee can do for you is easy here with Ewald’s Kia dealers Milwaukee! Thanks to our affordable Kia lease offers drivers such as yourself can get into a vehicle they will love without needing to burn a hole in their wallet. Leasing a Kia car with Ewald Kia can help you save cash by giving you a lower monthly payment and a lower down payment, helping you keep cash in your wallet while you shop. Getting a car with our current lease offers also makes repairing your vehicle more affordable as well, as your band new vehicle will be under the included factory warranty. You will also have an easier time changing into a newer vehicle every few years as well, if that is what you desire to do. Taking care of your trade-in won’t be an issue either, as you can simply drop your vehicle off at the dealership when your lease is over. 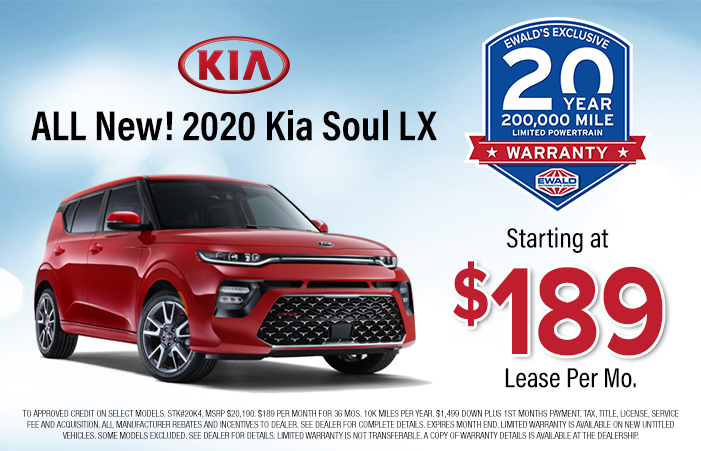 Our Kia lease offers and specials make your shopping experience much easier and help you get out on the road faster with a vehicle that you will love. At Ewald’s Kia dealership in Milwaukee we happily offer drivers like you a great variety of models and styles to try out, so you can surely find a vehicle that is right for your needs. 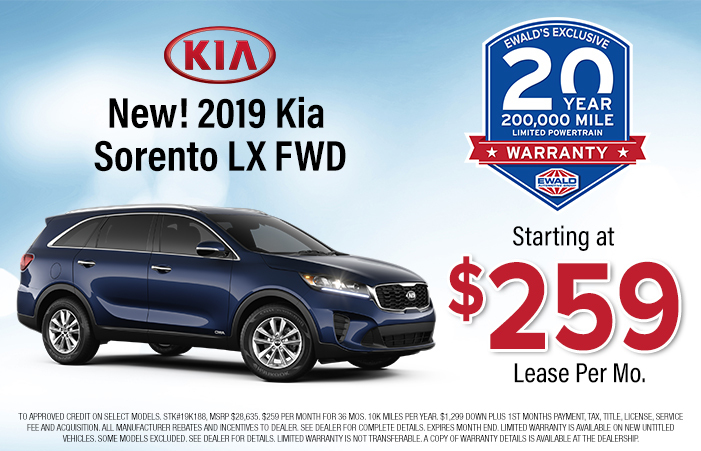 We have superb lease offers and deals on vehicles like the efficient new Kia Forte, or the popular new Kia Sorento SUV, and even the widely loved new Kia Optima for sale and much more. Here at Ewald’s Kia dealers in Wisconsin we aim to give drivers like you an easy and affordable shopping experience, so take a look at what we can offer you today. Our range of brand new Kia cars for sale and our selection of affordable Kia lease deals near you are sure get you back to driving in no time at all! 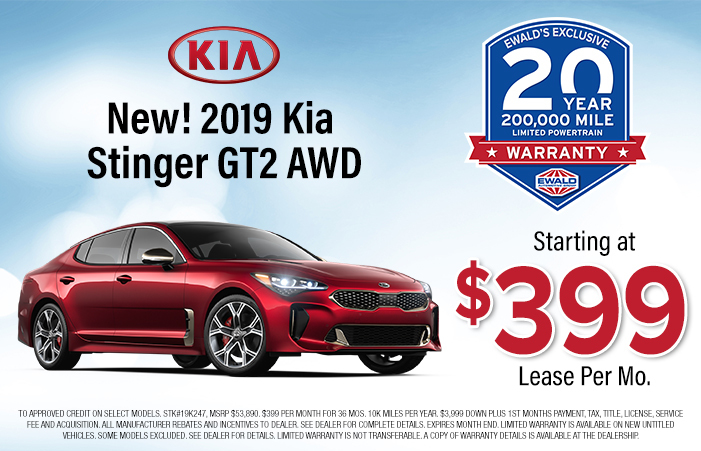 So if you want to have an easy and more affordable time getting into a shiny new car or sale that you will love, come on by Ewald’s Kia dealers near you today!